I wanted to make a different kind of gift for the grandparents this year and after seeing Mischelle's project she did, I knew this was it. 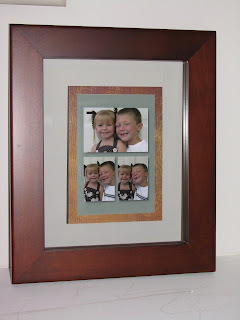 It is a frame that you can put a picture between 2 panes of glass. There is no mat except for around the picture that I did myself. 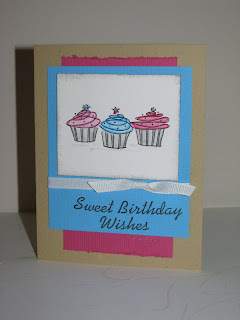 Just a little patterned paper and whalaa!! Now you can't really tell from my wonderful picture taking that the picture kinda "floats" there. The hardest part was centering the picture on the glass and getting the glass clean!! This collage feature is just awesome and was made using Shutterfly Studio that is free on Shutterfly.com website. It has been sooo long since I have done my own blogging!! But I actually did one of Heather's card sketches (if you haven't done one of these I would highly recommend doing one). Now granted, it was LAST weeks sketch but nevertheless, I did one. Now I didn't use TAC stamps at all but I love how it turned out!!! Enjoy! !